Words cannot properly represent a visual medium, and nowhere is this more true than in Nobuhiko Obayashi’s bizarrely realized, perfectly executed feature film debut, House. Behind its title’s unassuming exterior, House lies on a foundation of surrealism, psychedelia, absurd humor, childhood nightmares and Scooby-Doo cartoons (if the main cast were replaced by Japanese schoolgirls). Such a melting pot of elements creates a film difficult to comprehend, but incredibly fun to watch, even as it manages to subtly deconstruct cinema itself before your very eyes. The plot: seven young schoolgirls, led by the aptly-named Gorgeous, travel to the remote countryside to visit Gorgeous’s aunt in her titular house. There, the aunt is revealed to be a ghost who eats unmarried girls as she picks off the characters one by one. Though the film hangs on a conventional haunted house framework, the director exploits the simple premise to construct a vast canvas on which to splash color, horror, experimental editing and cheesy special effects. A piano flashes blue, red and gold as it devours a girl. We briefly glimpse a character’s entrance to the afterlife, full of swirling body parts, hypnotic rainbows and staring eyes. Another character sees her reflection shatter in a mirror, only to have her face chip away into a ball of fire. A watermelon becomes a severed head. 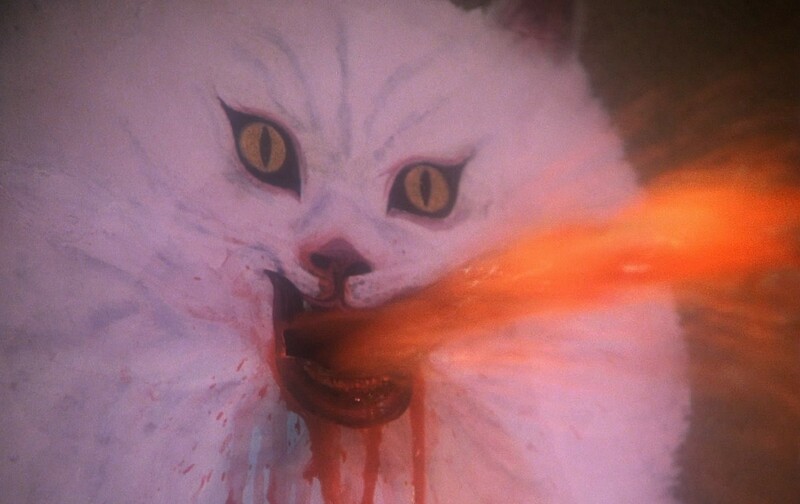 And, in a move which pre-dates YouTube, an auto-tuned cat sings along to the film’s title theme. The tone alternates between haunting and hilarious at the drop of a hat and good lord, is it bizarre! These brief descriptions come nowhere near describing the hypnotic, hallucinatory power of House. The film is so odd, so unique, it begs the question: Where did it come from? And perhaps most importantly: What does it all mean? First, some context: it was 1975 and Toho Studios was looking to create a horror movie to equal Jaws, the film that kick-started blockbusters. Contacting a variety of up-and-comers, the studio reached out to Obayashi, who was directing wildly inventive television ads at the time. Two years later, House hit theaters, where it was panned by critics, but adored by audiences. Despite successful box-office returns, Toho pulled the film from theaters early, afraid the success of such such an audacious creation would radically re-shape their image. And thus, House faded into obscurity until 2010, when it was unearthed and re-distributed by The Criterion Collection. But even by modern standards, critics and audiences struggle to comprehend House. Reactions have stayed surprisingly similar since 1977; the film is an absolute joy to watch and never has a boring moment, yet critics still seem to find little “deeper meaning.” Detractors all seem to revolve around the same subjects: the characters are flat, the editing makes no sense, the visuals are ethereal, but lack artistic merit. These critics simply do not understand Obayashi’s subversive intentions. When Toho asked him to make a horror film to appeal to the blockbuster crowd, the writer-director followed the studio’s directions to a fiendishly abstract degree. 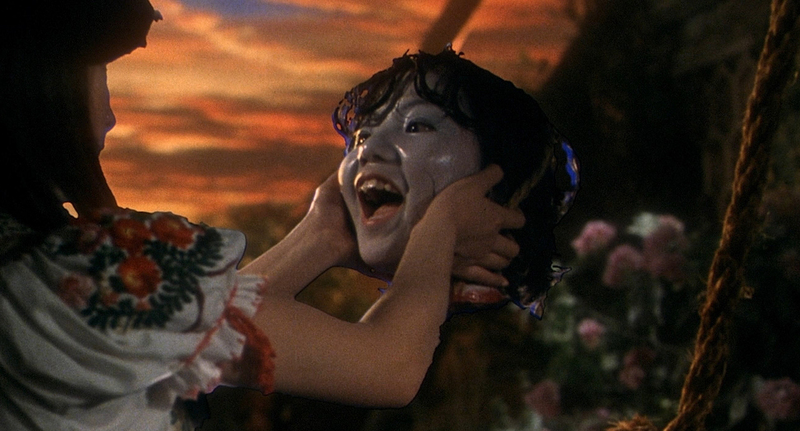 In the dawn of the blockbuster, Obayashi used House as a nightmarish deconstruction of the phoniness of studio filmmaking and a surreal examination of how films manipulate their audiences. The characters making up the cast are indeed incredibly shallow, and purposefully so. Each one is named after their single defining traits: Melody is a musician, Gorgeous is the lovely damsel in distress and Kung Fu is a martial artist. The characters are shamelessly made one-dimensional in an attempt to illustrate the lack of characterization spit out in studio horror films in which characters exist almost exclusively to be subjugated to violence. Obayashi’s flat characters are thus meant to be symbols of hollowness, rather than victims of it. The editing, which upon a first viewing seems random and incomprehensible, is actually a careful deconstruction of conventional editing practices. In an early scene establishing Gorgeous and Fantasy’s friendship, the editing makes their connection almost sickeningly clear. As the two hug, the camera spins 360 degrees around them, the film is slowed down as their childish giggling echoes through the soundtrack, the frame irises-in on their smiling faces, and they suddenly become surrounded by a composite image of sunlight shining through trees. The editing makes the emotions felt by the characters eerily artificial, so heavily constructed and manipulative that it makes the audience feel uncomfortable. No surprise, as Obayashi’s background in commercials required him to manipulate audiences in seconds. The film’s overall appearance, with its schlock special effects and frequent image manipulation, further serves to cement this notion. Composited matte paintings often come into play, placing all-too-perfect sunsets and landscapes into the mise-en-scène. In one hilarious image, the characters arrive in the countryside, represented by an obviously fake matte painting. The camera focuses its view wider to reveal that the background is actually a billboard on a country road, which itself also happens to be one enormous matte painting. And there’s so much more: Gorgeous’ beautiful stepmother frolics through a shamelessly blue-screened garden and sports a white satin scarf that is somehow constantly blowing in the wind. Flashbacks are presented as faded film reels. The score is repetitive and overly-dramatic. Obayashi uses falseness as an eerie aesthetic, giving the film an other-worldly quality which is difficult to describe in words. Obayashi’s deconstruction of filmmaking is written completely between the lines and does not make itself clear upon a first viewing, but unravels as you allow yourself to absorb the film’s breakneck pace and satire. The fact that a film like House exists at all is a small miracle; an experimental film with a studio budget which will induce fits of confused laughter, moments of uneasy fear, and an hour and a half of unforgettable cinematic energy and biting genius. It simply must be seen to be believed. Tags: Kevin Fermini, October 2015. Bookmark the permalink.